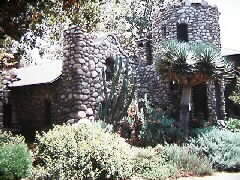 Lummis Castle (sometimes known as El Alisal) was built by Charles F. Lummis with his own hands. It was built of granite boulders and concrete between 1896, and 1910. Lommis was born in Lynn, MA in 1859, and moved to California. He walked there from Cincinnati, and along the way, he wrote stories which he sent to the Los Angeles Times. Does anyone have more information about it? Thanks to John A. Bahr for finding the info on this castle.